How to Add/Edit/Adjust and Delete merchandise items? From the dashboard, Choose the Admin menu. Click on the merchandise tab in the admin page. To add a product click on the add product button. Fill in all mandatory fields and click on the save button to add a product. Confirmation will pop up for adding the product. Click on edit button to edit the details you added. Click on update button once you are done with editing. Confirmation will pop up for update. Click on adjust button to make any adjustment. 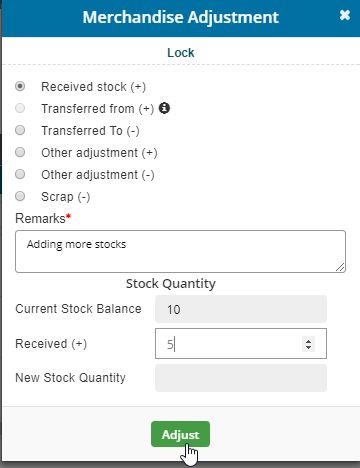 You can also add your stock balance by clicking on radio received stock button, Enter the number of stock received and click on the adjust button. 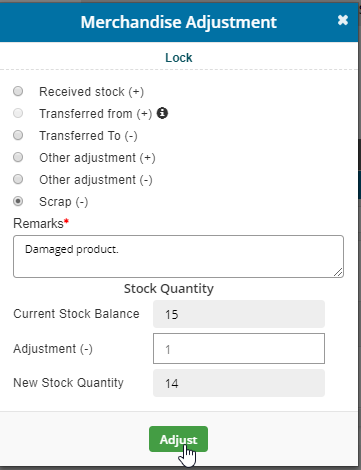 If you find any damaged product enter the damaged count in adjustment field and click on adjust button. If you wish to delete any product simply click on delete button. Confirmation pop up will appear click on yes to delete. Confirmation will pop up for the deletion.